With the invention of Square I just kind of expect all food carts to take credit cards, but unfortunately many of them still don't (in the pod at 10th & Alder I'd say about 40% take cards). I bank with an online bank so going to an ATM is a hassle which means I never, ever have cash. If you look closely in the picture above you'll see they've drawn a little Visa and Mastercard symbol on their chalkboard - that's the first thing I look for when I'm walking around the pod, is if they accept cards - if I don't see that they do, I keep walking until I find a cart that does. 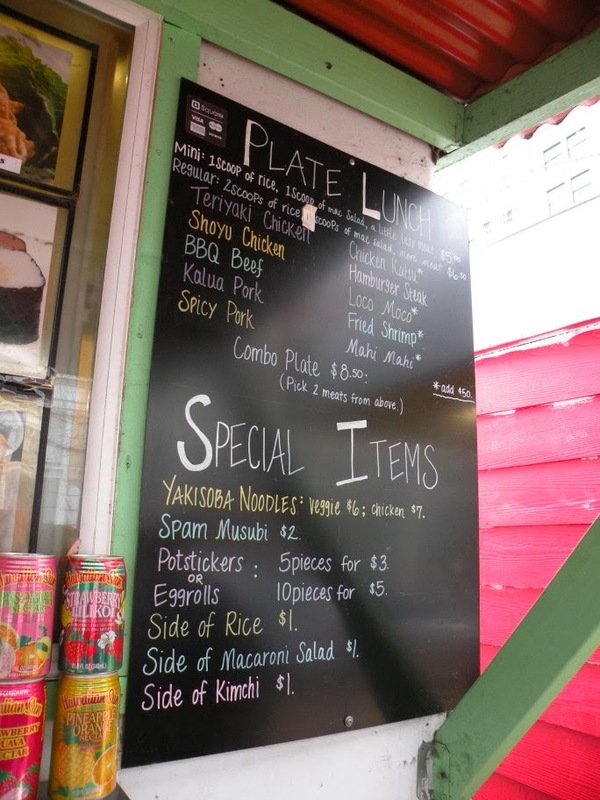 Island Grill has a pretty big menu for a food cart. I've had their spam musubi, teriyaki chicken and spicy chicken. The spicy chicken is definitely my favorite thing on their menu. After waiting for approximately 5 minutes I was presented with this wonderful little box. I ordered the Mini Spicy Chicken ($5.00). It is more than enough food for one meal with a heaping pile of spicy chicken, a scoop of rice, and a scoop of macaroni salad. The spicy chicken is very good. Island Grill uses good quality chicken breast (some carts use a chicken product that I'm not really sure is actually chicken) and the sauce is sufficiently spicy without being overwhelming. I dislike mayonnaise so I typically do not care for macaroni salad, but I really like it at Island Grill. They use a VERY heavy hand with the pepper when preparing their macaroni salad, which lends to a subtle smokey spicy flavor. 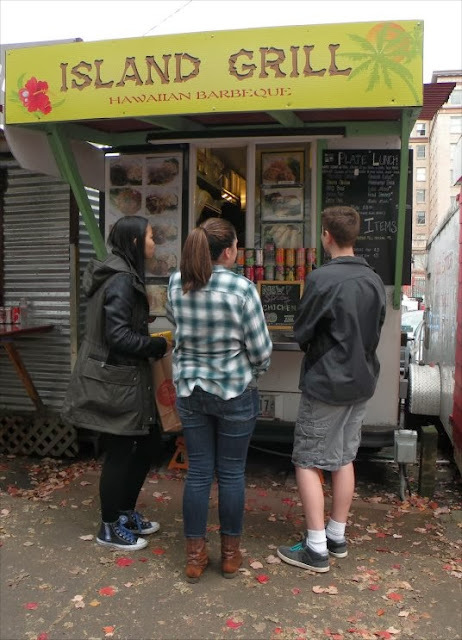 If you'd like to check out Island Grill Hawaiian Barbecue for yourself, they're located at the food cart pod at SW 10th Ave & SW Alder Street in Portland, directly across from City Target on Alder Street.